Surprise! It rained last night during dinner. 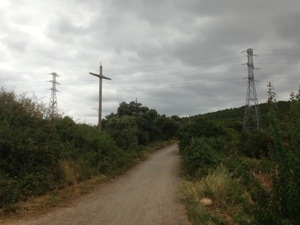 A bit and thunder and lightning too.This was a real blessing because it had been very hot all day and the rain provided welcome cooling. The forecast for today was highs in the 70’s and I planned to get an early start because I had a few more miles to hike than yesterday. Unfortunately, I woke up at 0640 which is 40 min later than usual. The usual rustling which begins at 6 am never happened. By the time I got my stuff together and had breakfast, it was 0830 or about an hour later than usual. 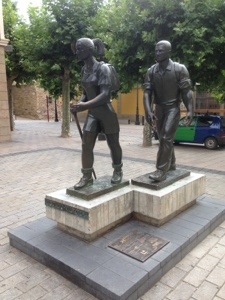 Tim and I walked to Logrono together where we said goodby as he headed for the train station. 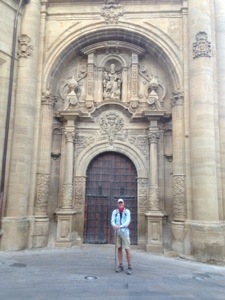 He is heading to Barcelona where he’ll stay with friends until he goes back to Wurzburg to work on Monday. I’ve enjoyed my time with Tim because he reminds me of my son Bennet. They’re both artists (Tim is a ballet dancer), they both have fashion model sisters and they both like to travel light. I walked alone for the rest of the day and I took it easy because my right ankle is really bothering me. 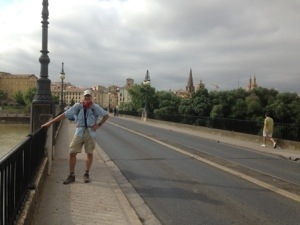 I’ve never had problems with it before, but I’ve also never walked 66 miles in 5 days before. I should probably take a rest day but that means I’ll have to take a bus to meet Kathryn in Burgos next Sunday. I’ll see how I feel the morning. 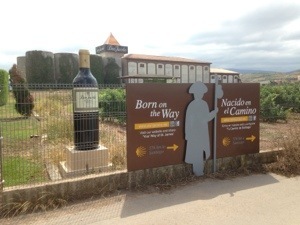 Left Viana at 0830, arrived Navarette at 1445. Total time 6 hours 15 minutes. 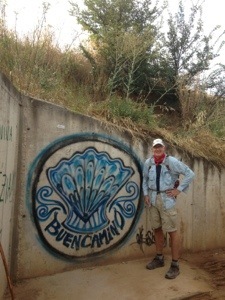 This entry was posted in Travel and tagged Camino del Santiago, Spain, Travel by rambler1959. Bookmark the permalink. Take it easy honey, miss you, but you look good out there. There is no schedule! just let each day be what it should be for you that day. Talk to you tomorrow. thanks for the posts.